Temperature is one of those things we don’t really think about—it’s just something we deal with. If it’s cold outside, we put on a coat. If things get a little chilly in bed, we reach for a blanket. Easy and inconsequential for the most part…or so we think. Research has begun to show that temperature can have a big impact on your health and general productivity, so it’s wise to pay a little more attention to the thermostat. A recent study out of the Medical Research Council in Glasgow, U.K. has shown that temperature plays a factor in the health and the well-being of children and people with respiratory problems. Using a sample group of people in New Zealand, the researchers found that the participants’ health improved when the temperature in their homes increased. Within six months, researchers concluded that the number of people who indicated that they had a “poor or fair health” condition declined by 50%. The study looked at other factors, but acknowledged that heat played an important role in health, and even in improving people’s relationships, as well as attendance at work and school. One of the biggest areas where temperature impacts our health is during sleep. Sleeping in colder temperatures can make it very difficult to achieve a good night’s sleep, even though many people feel otherwise. It’s true that sleeping conditions should be slightly cooler than normal, but not by too much. Staying somewhere in the 68-72 F range is ideal for slumber. When you go to sleep, your brain sets a target temperature for your body to achieve. If it is too cold—or too warm—this becomes increasingly difficult to reach, making good quality sleep hard to get. Grabbing for extra blankets, for example, may make it too warm. And if that cold air sneaks in to attack your feet, your plans are stymied! 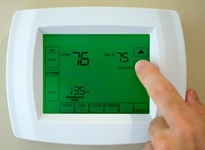 To improve your sleep, play with the thermostat a little bit. Because everyone is different, you may have to adjust the temperature for your ideal conditions. That being said, it should fall within the four-degree range mentioned above. Getting a good night’s sleep, research has shown, is extremely important to your overall health and functioning, so having the temperature high enough is important. It could be the reason why you can’t fall asleep at night, toss and turn, can’t fall back asleep after waking, and feel groggy and confused during the day. A Cornell University study looked at the ideal temperature for productivity, and found that the least mistakes in the workplace were made when it was 77 degrees and several degrees warmer than ideal sleeping temperatures. In fact, the temperature was raised from 68 degrees—the ideal recommended temperature to sleep in. Although it was only from a small sample group of employees at an insurance company and more research clearly needs to be done, this tells us something about how important temperature is to human function. When combined with research about sleep and sickness, it seems as though temperature may play a larger role in our health than originally thought. Doheny, K., “Can’t Sleep? Adjust the temperature,” Web MD web site; http://www.webmd.com/sleep-disorders/features/cant-sleep-adjust-the-temperature. Seaman, A., “House-warming improvements linked to better health,” Reuters web site, March 15, 2013; http://reut.rs/WMpv9m. Kellaway, L., “Facebook’s offices are too cool for women,” The Globe and Mail, March 18, 2013; http://www.theglobeandmail.com/report-on-business/careers/career-advice/life-at-work/facebooks-offices-are-too-cool-for-women/article9858629/. “Study links warm offices to fewer typing errors and higher productivity,” Cornell News web site; http://www.news.cornell.edu/releases/Oct04/temp.productivity.ssl.html.